The dressing for this salad gets a spicy kick from Calabrian chiles, a spicy, slightly fruity pickled chiles from Calabria, Italy. Chef Denton’s choice of Nasturtium leaves and petals adds gently peppery flavor and a burst of color. Recipe courtesy of Greg Denton. Bring a large pot of salted water to a boil and set up a large ice water bath. In a medium bowl, combine the olives, chiles, and vinegar. Slowly whisk in the oil until emulsified. Set aside. Add the snap peas to the boiling water and cook until crisp-tender, about 3 minutes. Immediately transfer to the ice water bath until completely cooled, about 5 minutes. Drain and pat dry in a kitchen towel. 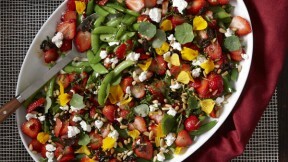 Arrange the snap peas on a large serving platter and top evenly with the strawberries. Drizzle with enough vinaigrette to coat, about 1cup, making sure to distribute the chiles and olives evenly over the salad. Sprinkle with the mint, chèvre, and pine nuts. Top with the edible flowers and season to taste with sea salt. Pass any leftover dressing at the table. The salad may be refrigerated for an hour before serving.